Back in my IBM days, a cartoon regularly made the rounds that we techno-geeks thought was hilarious. It can be so hard to explain how or why something works. 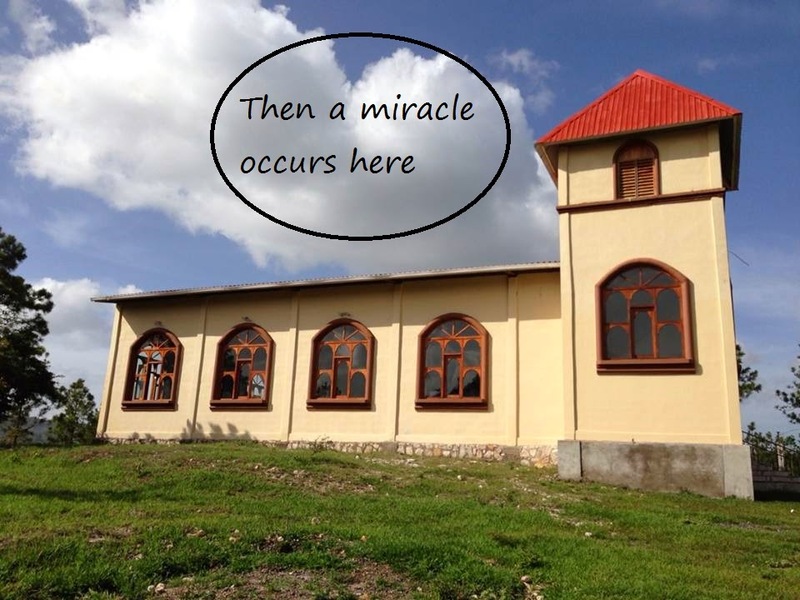 When sharing my experiences in Honduras, I often find myself saying, "Then a miracle occurs..." Reactions range from "Amen!" to a snort of derision. Neverthless, at times, it is the only explanation. 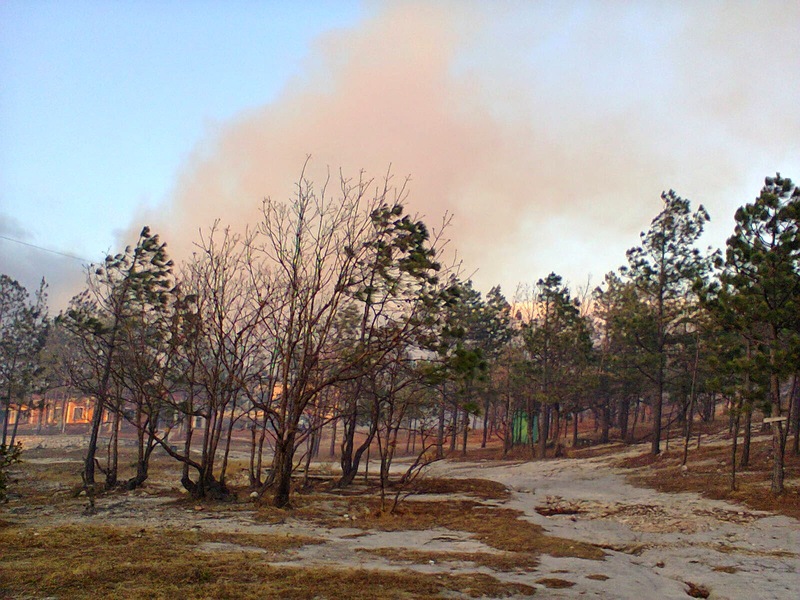 Last week, in the heart of the dry season in Honduras, a brush fire (by that I mean a massive fire that burns out of control, often across an entire mountain) approached our Children's Home. I first heard about it from a call from Margaret Merritt: "Amanda, I have some bad news..." I sat in my apartment in Roswell, Ga feeling helpless and frustrated as more information came in. Suzy: All the children are evacuated [to Suzy's, Casa LAMB, and the school in Flor.] The fire has reached the greenhouse...with the neighbors we are trying to fight it back. David and Evelyn are bringing firefighters from Teguz. They say we have to pay for their gas! Suzy: The fire trucks aren't coming. We can't contain the fire. God can, though, so we will leave it to Him. The fire has not reached the cabins or the church and the wind keeps changing direction, so it's impossible to know what will happen. Lord, we ask for a miracle. I realized I was not helpless and joined Suzy, and many others, in praying for a miracle. Isn't it easy to forget about God's power? To get so caught up in the moment that the situation seems out of God's reach? How silly. Suzy: David found a firetruck. They are coming from Teguz. [Our staff and] people from the community are still trying to control the spreading of the fire in direction of the children's home. They won't evacuate. Me and many others: Praying. Suzy: There is a lot of help here finally. The fire almost reached the church. But the firefighters pushed it back. Still, I can't even see the church for the thick smoke. David: Nobody was injured. The fire was very close to the Chapel, the school, the boy's cabin, and the kitchen. The firefighters worked until midnight. The fire is out but there is too much smoke to see buildings. The next day, Arely went out to investigate. She discovered the fire completely encircled our property! Not one of our children, staff, firefighters, or buildings was injured or damaged! And today I got another text from Suzy about a sweet young former staff member who had been battling anorexia for 10 years. She had had a feeding tube for over two years and would "sometimes" let her family feed her through the tube. Out of the blue she called Suzy. "God cured me! I am eating. I feel like I have been resurrected!" 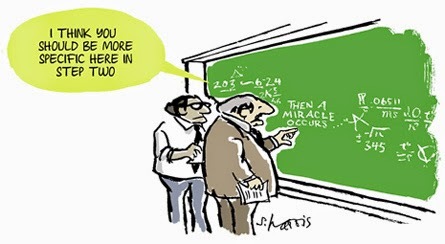 Miracles happen all the time. We don't know how but we always know why. May every week be a Holy and blessed week for each of you. And all God's children said, AMEN!